(1) At least one overnight stop, (2) requires a whole day, (3) requires more than half a day &ndash; you may have time for a few turns (4) arrive by lunchtime and ski all afternoon, (5) there is a main airport within an hour of Chamonix. (1) There are no buses or taxis to Chamonix, (3) there are slow or infrequent buses / trains available, (5) getting to the resort is easy with frequent bus / train connections. (1) No places to stay in/near Chamonix, (3) a few places to stay in the resort, (5) a wide variety of accommodation suitable to suit all budgets. (1) No luxury accommodation available, (3) just one or two luxury hotels so book ahead, (5) several up-market hotels in Chamonix. (1) There are no child care facilities at Chamonix, (5) the resort has excellent child-care facilities including at least one reasonably priced creche. (1) Occasionally gets enough snow for skiing, (2) is often closed due to a lack of snow, (3) occasionally suffers from a lack of snow, (4) rarely suffers from a lack of snow, (5) Chamonix is snowsure even in the poorest seasons. (1) Chamonix relies entirely on natural snow, (3) there are just a few snow cannons, (5) there are snowmaking facilities on all pistes. (1) There are no snow groomers at Chamonix, (3) occasionally some pistes are left ungroomed and in a poor state, (5) all the runs at Chamonix are groomed daily. (1) there is nowhere to ski when it is windy or visibility is bad and lifts often shut, (3) there are some trees for poor visibility but main lifts sometimes close, (5) Chamonix is mostly in forest where you can ski in flat-light and windy days, lifts rarely close. (1) If snow conditions are poor at Chamonix, it will be poor everywhere nearby, (3) there are good alternatives within an hours drive, (5) other locations on the same lift pass provide a rich variety of snowsure ski conditions. (1) Chamonix usually has poor snow conditions compared to other resorts in region, (3) has average conditions for the region, (5) usually has the best snow conditions in the region. (1) The staff at Chamonix are rude or unhelpful, (5) lift staff at Chamonix are pleasant, cheerful and eager to help. (1) The ski runs are featureless and unvaried, (3) the ski runs are varied but not extensive enough for a week, (5) Chamonix has diverse and interesting pistes including forests and high alpine terrain. (1) No intermediate terrain at Chamonix, (3) intermediate skiers will get bored after a few days, (5) vast areas of cruising runs. (1) Not even a kicker at Chamonix, (3) average sized park quite well looked after, (5) huge park area and expertly crafted pipes, jumps and boardercross trails. (1) There is nowhere to go for cross-country skiing around Chamonix, (3) there are some cross country trails available, (5) the area features many spectacular and well maintained cross-country trails. (1) No designated luge or toboggan runs, (3) there are toboggan runs that open quite often, (5) Chamonix has long and well maintained luge / toboggan facilities suitable for all ages. (1) Overall, Chamonix is one of the most expensive ski resorts in the country and not worth the money, (3) overall represents average value for money, (5) overall offers the best value resort in the country. (1) Overall, Chamonix is one of the most expensive ski resorts in the world, (3) overall it offers pretty average value for money compared to resorts from other countries, (5) internationally the resort offers excellent value for money. 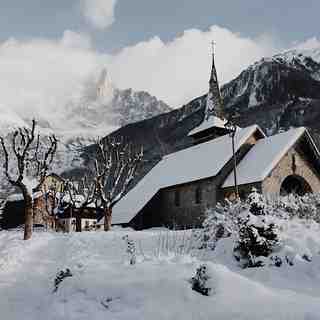 Chamonix has excellent scenery, truly some of the best I have ever seen. The ski area makes the most of these views but the runs cannot compare to Zermatt, Verbier, Trois Valais, Arlberg or Dolomites. It's a busy town with antiquated lifts and unquestionably has the very worst restaurants I have ever been to on ski slopes in 35 years of skiing. Over priced, foul quality with the atmosphere of Soviet era railway stations. Indifferent service, lousy variety and very low quality. Tendance Foehn is the worst of the worst! Chamonix is great for advanced off piste. There are some really classic routes, although with the glacier dropping some are getting quite dangerous, like the Pas de Chèvre. My advice would be to use a guide if you want to get the most out of Cham. Just join the ‘guide day’ group which you can book at the Guides Office. It’s quite cheap at around 85 euros and you just ski with whoever else has pitched up. You meet some interesting people and enjoy a guided day for a fraction of the price of hiring your own guide. Often the guides prefer to go through to Courmayeur and there are great off-piste routes there too. The food is better there too! My nephew & I got invited on a 30th birthday long weekend at the end of Jan 2017. The 7 of us got into town just after 12pm. The hire shops were closed from 12-2pm . What's that all about? After an hour or so in a "steady" bar we headed back to the hire shop for gear, hoping to catch the last 2 hours on the slopes; the hire shop wouldn't allow us to leave our footwear there. Fair enough! Next morning we hiked up the road to the gondola from town, not impressed by the local mountain. Buses next day to the other mountains, no snow-making to top up through lack of snowfall. Les Houches was probably the best area. Nothing challenging but quieter than Argentiere. More nightlife at a whist drive, you can keep Chamonix. I'm struggling to find something good to say, it's back to good old Austria for me. I'd rather take up indoor bowls than be paid to come back here, not impressed. I skied in Chamonix on Saturday, 18 Feb. 2017. It is a short day trip from Geneva. I took the bus from Geneva bus station at 08:30 skied until 15:30, then took a rest and took the bus back to Geneva at 18:30. Return bus ticket 50 Euro. I chose to ski at Brevent and Flegere, which are the ski centers closer to Chamonix center. You must take a free bus to get to the gondola. The bad thing is that you have to carry equipment from the city, as there is no place to rent at the mountain. This is bad because when getting back the bus was late and became too crowded with people carrying their skis. Lift ticket is expensive at 50 Euro per day. However, in my opinion, it deserves the money. Brevent and Flegere are, in my opinion, best for intermediate skiers. There are mostly reds and blues. The two black pistes leading down to the city (Nants, La Praz) were closed due to a lack of snow. There was generally quite a lot of snow. However, there were many places with stones, especially the pistes exposed to the sun. Generally speaking, Brevent had harder, even icy, snow whereas Flegere had softer more forgiving snow. I enjoyed the red Cornu in Brevent and the black in Floria Flegere. Also, the red Crochues and Pylones. The background is beautiful, as you can see the Chamonix valley and on the other side Aiguille du Midi and Mont Blanc. There is a frequent lift linking the two ski centers. Chamonix is a nice city, not so much charming but for sure there are many things to do, always full with people and nice to stroll over there. Food was not good, very touristic. Quality before quantity. Chamonix, how I love and hate it. In some ways, it's simply the best place to ski; ever. In other ways, it's like a high maintenance beauty that's emotionally unstable. The Aguille Du Midi and the Vallee Blanche are stunning, also Grand Montets is an amazing ski area too. Any advanced or expert skier could live here forever and die happy. However, oddly for many others it really should never be recommended. Let me explain. Mont Blanc is on the western side of the Alps and is the highest peak, so it attracts the most unstable weather. This can be good because it will probably get some of the best snow, but then can also be bad because fog, rain and high winds are more likely. Cham is at an altitude of only 1000 meters meaning many of the lower runs will be unskiable most of the year. The locals seem slightly laissez-faire: the first lift doesn't open until 8.45 or 9 and you could be hanging around with no information. Then the lifts shut at 3.30. The town is massively popular so the big cable cars on Montets and Aguille Du Midi have to be pre booked. Some of the ski areas are at a stupidly low altitude and are far apart needing long bus journeys. If you ski the Valley Blach you're unlikely to ski for more than 1.5 hours the whole day over a 1600 meter vertical drop. So for the improving intermediate or low advanced skier, on a six day ski holiday, Chamonix is a bit of a disaster area. You spend more time queuing, sitting on buses or on slow antiquated chair lifts than you ever will skiing. In this case, it would be better to find a ski area less crowded, better situated and open for longer to get the most from your precious short time on the snow and paying 5 Euros for a can of cola. However, if you are an expert skier looking for a place to live Chamonix would be a great choice. If you have a season pass and just ski those blue-bird days after a snowfall it couldn't be better. Or maybe you've fully mastered the gnarliest, steepest black runs, and are bored of regular resorts and need some insane ice-climbing/mountaineering skiing. I'm not saying Chamonix isn't amazing or shouldn't be on every skiers bucket list, but it is something to work toward, especially if you have already had at least 10 days on snow that year. The 'king is naked', and the management has to realize it.... Maybe 100 years ago, when alpinism was an unknown word, the area gathered thrilled pioneers of the mountains and the winter sports. But in the era of snow resorts like Tignes, Trois Vallees or Sankt Anton am Arlberg (AT) this resort seems like an old aristocrat in decadence. The extremely variable weather and the almost always poor snow quality are obvious reasons for not opting for this "famous" resort. Besides, the 50Euros day pass gives access to only one ski resort (of the size of Bansko in Bulgaria) and not to three as the management claims: it requires at least one hour from base-station to base-station to change a station; if you decide so in the middle of the day. All in all, the day pass is overpriced, unless you include in the evaluation the breathtaking scenery; if the weather allows it. The unusual "offer" to cross the tunnel and to ski in Italy requires not only a respectful amount of money and but usually some time spent on the long waiting queues of the tunnel. Local transportation is very poor and a personal car is more than essential. However, the use of public transportation is strongly recommended but never actualized by the local authorities. Above all, in sustainable developed ski resorts of Austria (and elsewhere) the reimbursement of the ski card is self evident. The obligatory possession of the ski card does not influence the will to return back to a ski resort with so many disadvantages. Fantastic scenery but inadequate infrastructure. The key lifts [e.g. Parsa at Brevent] and Grand Montet are woeful. Huge crowds/very slow/too expensive. I will never fail to be be captivated by the beauty of the place but after ten years of going three or four times a year I have realised that the customers are being taken for mugs. Definitely visit if you can get there, but only in a quiet period; avoid if it's a busy one! I love Chamonix; I hate it in equal measure. I've been there in summer and winter and had great times and truly terrible times there. I'd consider myself a solid off-piste skier with many powder trips under my belt. But I'd still say that without a guide, I'd be really cautious of taking on some of Cham's powder as the danger factor is ramped up on the heavily crevassed glaciers and risk from seracs above. Maybe I wasn't looking hard enough or didn't have the right inside knowledge but I struggled to find good stuff in what I'd call a reasonable distance from the lifts. As I said, get a guide who will presumably open it all up for you. You've only got to have one timid off-pister in the group to make the powder off limits without splitting up. Most of us can't afford a guide for the whole week. So while we all talk a good powder game, I'd say for most of us, to get a good shot at enjoying powder on your one week away I'd go elsewhere. Controversial I know! For a long weekend, the pistes are fine with plenty of variety around the valley. For a week, you really do need to get off-piste so without a guide or a seriously blinkered view of your own mortality you're going to be struggling. Chamonix, like any mountain centre, is at the mercy of the weather and Mont Blanc does seem to create a bit of a micro-climate. So you may find the powder lines you've researched all autumn are totally out of scope when you get there. Be flexible and prepare to get in your car and try elsewhere. The town itself is good fun with something for everyone. Want posh? It can out-posh the Beckhams. You want grungy? No problem, Cham can go cheap and dirty as you like. As others have said, it benefits from the authenticity of being a proper town, even though the whole town is geared around tourism. My advice? Give Chamonix a go, maybe for a long weekend at first. Just don't expect it to scratch all your powder itches without serious investment in guides and a touch of good luck with the weather.